If you want to better understand the current SBCERS pension crisis you have to know where to look and what you are looking at.Santa Barbara County has attempted to deal with the PENSIONS unfunded liability for the past 24 years by contributing an additional 55% (yearly average) above the required normal level. While at the same time the pension now reports earning an outstanding 8.5% yearly compound return on investments for the same time period. The current pension deficit values just do not seem possible based on those two factors alone, but wait I have more. http://www.countyofsb.org/uploadedFiles/SBC/RPAAC/C%20-%20Employer-Employee%20History%20of%20Costs.pdf Page six of this report represents the Employer Cost History for the SBCERS Pension paid by the County. This pension cost history document was created and used in 2009. Based on the contribution levels claimed under the “Normal’ and ‘Unfunded’ levels in this document, I was able to determine that Santa Barbara County has been contributing above the normal rate by a 24 yearly average of 55%. This document also gives past funding and unfunded levels starting with December 31st 1986. Based on other documents I am about to share with you we cannot trust the reported values in this 2009 History of Cost report. I was able to find on Wall Street and verified through our State Controller’s archived audits. That Santa Barbara County elected officials originally reported to both that the SBCERS pension was at least 100% funded in 1986 and 1991. So if the SBCERS pension fund was a 100% funded in either of those years we now have a few serious problems. 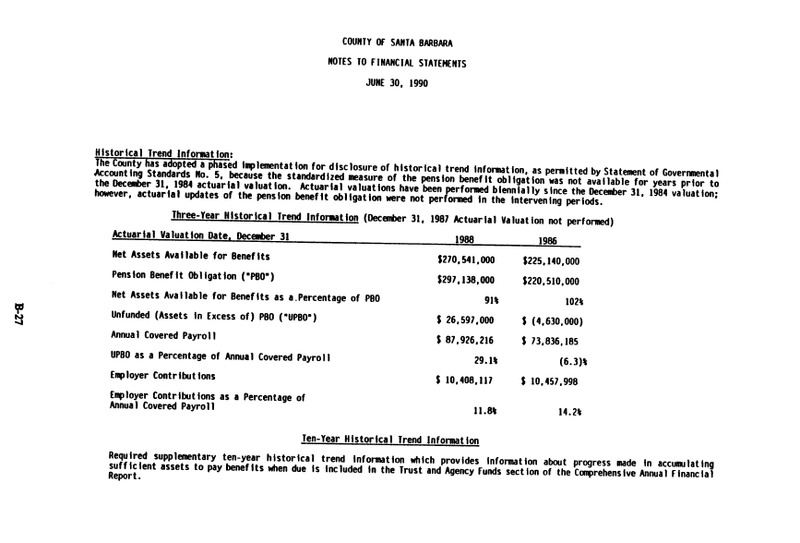 As you can clearly see in this document taken from a 1991 bond offering by Santa Barbara County the values being reported differ greatly from the 2009 cost history above for 12/86 and 12/88. http://magicinsantabarbara.files.wordpress.com/2011/08/92bondmarketsbcountyfullyfundedpension.png The next issue that has been created because of my irrefutable findings is again with the values being reported in the 2009 Employer Pension Cost History. This chart reports funding ratios that drastically differ from those found in the State Controllers archived reports. The 2009 history of cost chart shows that on 12/31/86 our SBCERS pension was only 67.10% funded yet the archived State Controllers Audit shows the fund to be 102% funded. The 2009 report claims the pension was only 67.20% funded on 12/88 while the archived Controllers Audit for shows a 91.00% funded value. Again we have another huge discrepancy between the two sources for 12/31/90. The 2009 document shows a 61.40% funded vs. the Controllers reported 82.9% level. Please keep in mind that regardless of the differences in values and funded levels the same source provided all the different figures, our Santa Barbara County Elected Officials. The change in values clearly occurred between 1995/96 and 1996/97. Review this 1995/96 State Controllers report found @ http://magicinsantabarbara.files.wordpress.com/2011/07/1995-962.pdf . All the data in it matches the higher values found with the State Controller and Wall Street. However just one year later again in State Controllers report @ . http://magicinsantabarbara.files.wordpress.com/2011/07/1996-971.pdf . The SBCERS pension values now magically match with this 2009 history of cost document. http://www.countyofsb.org/uploadedFiles/SBC/RPAAC/C%20-%20Employer-Employee%20History%20of%20Costs.pdf . So why was the pension values and funded levels retroactively altered and by whom? If you take the time to review the documents and follow along with my concerns in order I am sure you will come to have the same concerns as I. In review I am questioning how If you start with a 100% fully funded pension value. Then you contribute yearly 155% of the normal required contribution rate. While earning an outstanding 8.5% compounded yearly return on investments be anything but currently fully funded and with a huge reserve. IT IS JUST MATHEMATICALLY IMPOSSIBLE TO BE ANYTHING ELSE! www.santabarbaracriminalcourtcorruptionblogspot.com S.B.C.C.C. The place where COMMON SENSE never goes out of style!